I’ve intentionally embarked on reduced calorie diets off and on since 2006. The main thing they had in common was this: I was not good at sticking to a reduced calorie diet, ever, without eventually wanting to give up and cheat, giving in to small temptations, and being discouraged at the slowness of my results. In the distant past (2010), I was a vegetarian subsisting mainly on fake meat products, sauteéd vegetables and quinoa, vegetarian frozen lunches containing sauces and a lot of rice and pasta, eggs and cheese, and spaghetti by the mile. When I was dieting, it was difficult to get “enough” calories in a day unless I was eating a lot of cheese, or a lot of carbs – and sometimes, the way I saw best to round out my calories was allowing myself a brownie, cookies, ice cream, whatever sugary thing was on hand. As long as I was below or at (or maybe, oops, a little bit over) my caloric limit for the day, I was doing ok. I missed my protein intake, I always had more carbs than I thought, and I believed fat was the devil. Oh, and I could have one cheat day a week. Sometimes, that turned into a cheat weekend. Well, I was going on vacation and not working out again. Maybe I wasn’t going to try so hard to eat well for…a month, two months, half a year, besides eating technically-meat-free food that was often sugar and refined carbs. Yeah. I was doing it wrong. 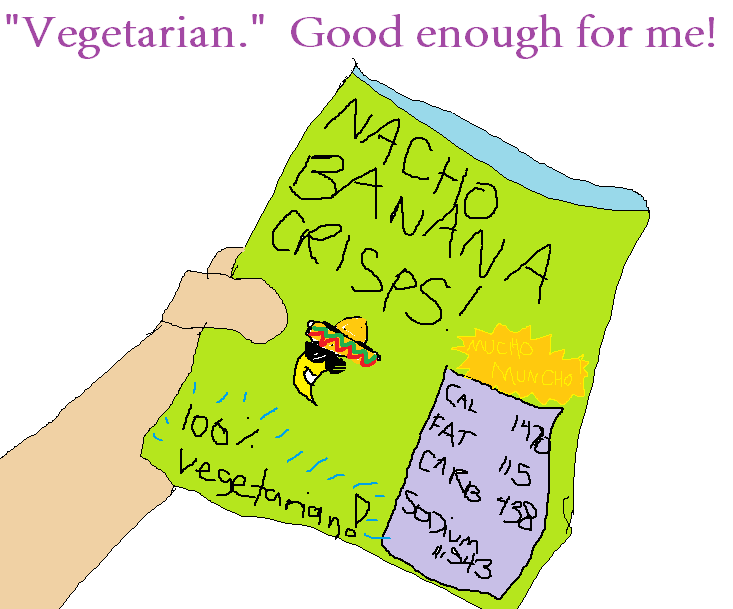 Nacho Banana Crisps. Is that such a bad idea when you think about it? Yes? Ok, I’ll just show myself out. In the even more distant past (2006), I started seriously looking into fitness. I worked out in my office building’s gym with my friends from work and read the women’s fitness magazines one of them brought along. One publication in particular had monthly fitness features and recommended food plans with a week’s worth of meals laid out on its glossy pages. When I picked up a weightlifting book a couple of years later, I found that it devoted a chapter to a number of high protein recipes. These were surely the keys to weight loss. But only, as it turns out, if you ate meat. I remember leafing through them, vainly hoping that at least one of the meals would be vegetarian. How nice would it be to be told exactly what to eat, to have a system that took all the thought out of it? I’m not a great cook. Because I grew up not wanting to waste food, I’ll eat almost anything I make, but I certainly don’t enjoy cooking the way some people do (baking is another story). Give me a recipe I can nuke in the microwave, or a magic loaf of bread that fulfills all my daily nutritional requirements and tastes like banana nut bread. But please, I thought, no more recipes including salmon. No grilled chicken. No more soaking beans overnight to make an approximation of a burger that will be filled with oats and disappointment. The feeling of hopes dashed faded quickly to resigned expectation and acceptance. I guess I’ll just eat steamed vegetables…forever? And quinoa, I guess. A complex, satisfying, easy-to-make vegetarian meal’s appearance on those pages was a rare enough event that if it happened, I don’t remember, which also speaks to how good the recipe might have been. Maybe it was an olive, mint, and sardine salad dressed in a peanut butter reduction! Mmm. 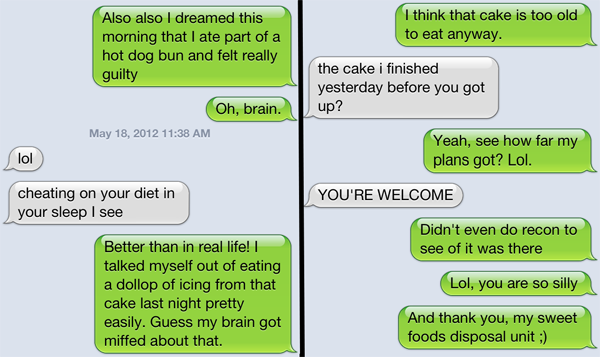 And now that we’re all no longer hungry, let’s talk more about my easier, more recent, and more balanced food choices. Teamwork – my boyfriend supports me in my new way of eating, even going so far as to sacrifice his body and heroically eat all the cake in the name of keeping me honest. I’m so lucky that I love all the food that I’ve been advised to eat right now, and that they’re all satisfying. That makes all the difference. My lunches vary from week to week, but as I scroll through photos of my food, I see recurring themes: raw vegetables, fresh and frozen berries, reasonable portions of meat, eggs, small amounts of cheese, select nuts, and very few breads, legumes, and grains. I’m not always scanning the horizon for the next miracle, and I don’t have to think that hard about what my choices will be in the grocery store with such simple ingredients. I don’t miss bread, sweets, corn, or potatoes all that much, although occasionally, I do splurge. And I mean very occasionally. I’m making such great progress that I usually have to talk myself into throwing myself a curveball. That seems like humble bragging or a successful dieter problem on the order of first world problems. But I just don’t want to fall into bad habits again, and frankly, the things I’m missing out on don’t seem as vital to my life as they once did. I had one piece of the cake that was mentioned in the above conversation. The piece was great, but I was definitely done after one, and it’s likely I would have been satisfied with just the icing. Then, last Friday, I made myself take a cheat meal at McDonald’s, where I got an Angus burger with an order of fries. That was a bad idea. Bad, bad, bad idea. The burger was just ok, the fries were not fresh and not very good, and eating them gave me gastric problems all weekend. And yet, as not-great as those fries were, I automatically ate every last one of them down to the bottom of the carton, then rummaged in the bag for the end pieces and any strays. So much for moderation and portion control. Much better idea: sticking to what I know is delicious, good for my health, and satisfying to my palate and satiation. “Your dinner looks great. 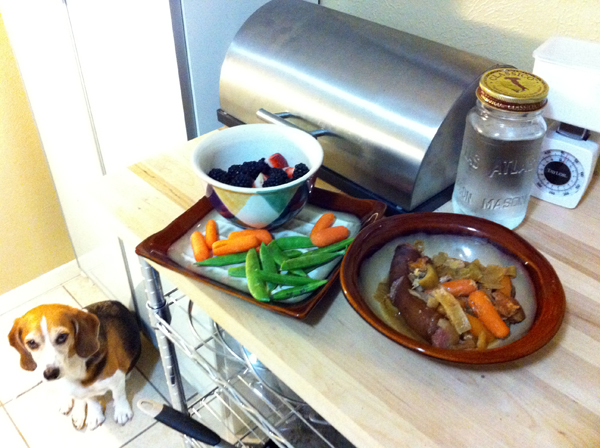 But listen to this: it would look even better in my food dish.” – Beagles, nature’s sweetest con artists. Dinner one evening consisting of mixed berries (in the bowl), mixed raw veggies on the plate, and pork loin stewed in carrots, onions, pineapple, and cranberry sauce. The dog would love to eat my dinner, if I let him. The onions could actually hurt him, but the other veggies are ok, and I usually sneak him at least one carrot or pea pod. 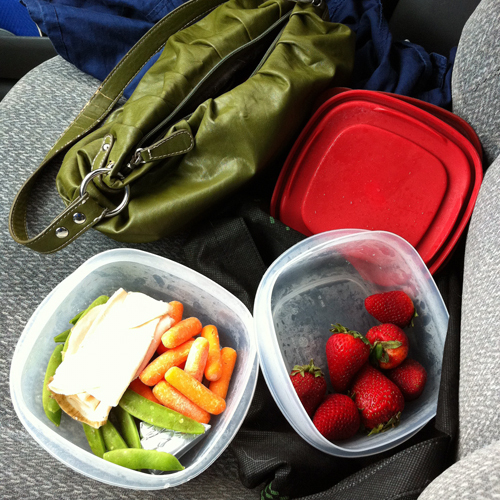 I multitasked on the way to the bank one afternoon by eating my lunch in the car. Luckily, it’s mostly finger food. The veggies serve as soft cheese vehicles. My usual lunch of deli meat, carrots, peas, soft cheese wedge, and strawberries. I’ve had it so often over the last three months, and I’m still not tired of it. Sticking to my guns has paid off in spades. I weighed in this morning at 168 pounds. That puts me 5 pounds away from the target weight my doctor gave to me. Using the crudest of BMI calculators, I’m now at 29.8%, so I’m limboing under obese into just overweight. That’s pretty great. And allow me to display stats from September 2011 through this morning that show you the amount of weight I’ve lost as well as tape measure data. 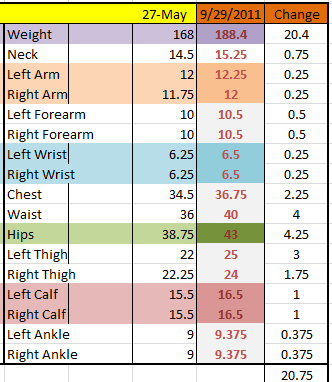 This spreadsheet snippet shows my progress since mid-September 2011, when I first began tracking my measurements. The total at the lower right is inches I’ve lost. This shows the change in my body over the last 8 months, and a lot of this progress has been made since February. I was barely treading water until I was given a plan that worked and that I was able to stick to so easily. It’s no miracle, and based on my dietary choices of mostly vegetables, fewer carbs, and fewer calories, it shouldn’t be much of a surprise, either. The most surprising thing of all is the satisfaction I’ve found in my new habits. That satiety is stronger than all the self-discipline and willpower I’ve ever been able to muster. This entry was posted in food, health and tagged fast food, food, goals, habit, low carb, paleo, Photos, results, scale, weight. Bookmark the permalink.